"Fantastic deal. The oscilloscope is in very good condition. Packed for shipment to survive anything"
"Premium equipment. Excellent communication. Fast. Best value!" "There was a small issue; The people at BRL Test were 100% responsive and issue resolved. Thanks!" "Best packing ever! I would let you ship one of my children!" "Unit received in great shape. Passed Agilent calibration. Good job!!" "In every aspect these guys are great!" 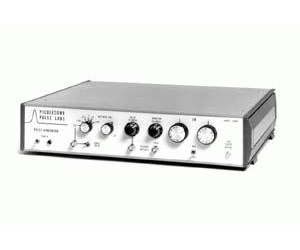 The Model 2600C Pulse Generator produces high amplitude 45 V, fast (<500 ps) risetime pulses. 50 V, 250 ps risetime pulses are available with the “Turbo” option. The pulse duration can be adjusted with a front panel, ten-turn control from < 1 ns to 100 ns. Either a positive or negative polarity pulse is selectable by a front panel switch. The amplitude may be adjusted over a 70 dB range in 1 dB steps while an internal clock provides pulse repetition rates up to 100 kHz. A programmable GPIB version of the 2600C is also available; see the specifications for the Model 10,300B Programmable Pulse Generator (see 10,300B). Copyright © 2019 BRL Test. All Rights Reserved.